Fujian art museum is a public institutional organization of social culture with such functions as collection the excellent art works, developing the academic research, holding the display and exhibition, promoting the art and cultural exchange，it is influential in the province and outside in the modern and contemporary period. Since its founding in 1981, the Fujian art museum has become from a exhibition site with single function to art exchange center by several generation’ s efforts , especially in these years, all development projects of museum has made the considerable progress and enjoyed the great popularity and enhanced its position and increasingly become a significant window of cultural exchange and important place of people’s spiritual life in Fujian. 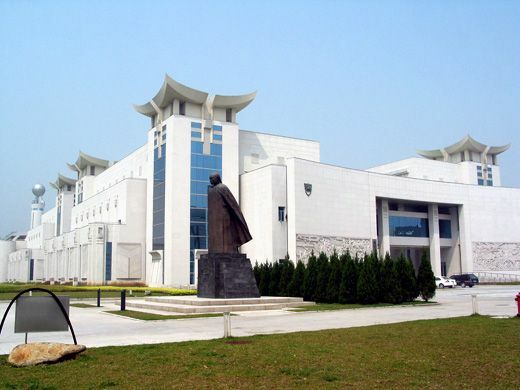 Fujian art museum consists of executive office, display and exhibition department, academic theory department, public education department and collect and protect department which performs its own functions and connected with each other to make a good job of professional business and research and development and simultaneously ensure museum running well. The exhibition room of Fujian art museum covers the area of 1200m2 with the standard route development 320m that could hold the medium and large scale or various kinds of art works together, since its funding, the museum has hold the exhibition for hundreds times with the audience reception of 0.6 million people and 30 thousand artworks on display and some of which are from Japan, Chile, Columbia, Scotland, Finland, Hong Kong and Tai wan. Once lacquer painting is mentioned, Fujian will be refer to together, thank to the intense atmosphere of lacquer culture in Fujian, our artists are mainly producing lacquer painting and won many prizes in all kinds of competition with more than twenty years experience, their artworks are not only collected by national art museum of China but included in the “Chinese art complete works. Lacquer painting Volume”Our museum has collected many fine artwork from Fujian lacquer painter and previous national award artworks and we have had more than two hundreds of art work collection inclusive of Fujian old and new lacquer painter’s master work and other high artistic value works, for example, state-level craft master Wang Heju’s 19 art treasures inclusive of “Lao Zi leaving pass”, Qiao Shiguang’ s “ Fuzhou Liberation Bridge in the 1960s” , Wu Chuan ’s 7,excellent artworks inclusive of “ Mist” and “Haystack” , Zheng Yikun’ s “ Still Life” and “ Goldfish” , Chen Lide’ s “ Bright Moon and Red Candle” , Liang Yuchu’s “ Release the lantern on the sea” and other award winning artworks from almost 60 artists such as young and middle aged painter Zheng Jinsheng, Zheng Xiuling, Wu Jiachuan，Tang Mingxiu. As the lacquer painting is concerned, our museum is one with most and relative high quality and complete collection and is influential at home and abroad. Over twenty years, by means of special subject collection, acceptance of the donation, higher authorities allocating, artwork in place of rent and special fund for collection, our museum has collected a thousand artworks which consists of oil painting, traditional Chinese painting, lacquer painting, folk famer painting and calligraphy, more than 600 artworks of them are made by dozens of famous artists that includes Xu Beihong, Lin Sanzhi, Ya Ming, Li Jianchen, Chen Zifen, Song Xingyu, Li Shuoqing, Gu Yichen, Li Geng, Li Xia. Fujian art museum entering the new century has tried to achieve the goal of perfect function, rich collection, ultra-modern facilities with a brand -new look and effective work and made its own contribution to the cause of Fujian art and achieved more success on art for Fujian people.